We are not called to help people…? Last September, I went to Dallas for 5 weeks for missiological training in preparation for coming to Papua New Guinea for 18 months. This was required for my status as an Short Term Assistant. During these 5 weeks, I took 4 classes dealing with Anthropology, Linguistics, Biblical Reflections on Missions, and Foundations of Ministry. I was introduced to many great mission minded authors and read many great books geared to cross cultural ministry. One of the book I read was Cross Cultural Conflict by Duane Elmer. Before I left for Papua New Guinea in January, I ordered some books that I wanted to read to further my education on cross cultural ministry. 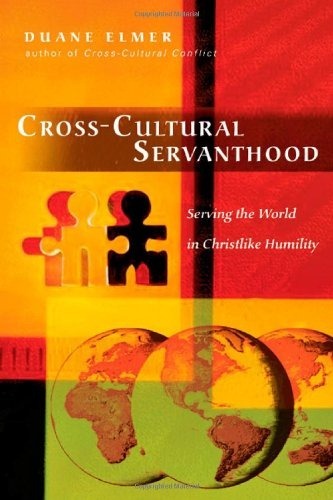 One of the books I read recently was titled, Cross-Cultural Servanthood Serving the World in Christlike Humility by Duane Elmer. I read this book during my 5 week stay in the village this past April. I recommend this book to anyone seeking to serve others. After all, this is the goal, to serve God through serving others. I want to capture some key highlights that touched my heart strings from the first three opening chapters of the book. I will present at a later time, the 6 step process of servanthood defined by the author. This grabbed my attention right away, we are not called to help people. Really? Then what is serving? Isn’t serving others, helping others? The quote is not finished, as I continued to read, it becomes more clear. We are called to follow Jesus. Thus following Jesus we learn how to help others and be helped. We first set the focus on Jesus and let him direct our paths. If we serve Christ first, we indeed will serve and help others. Jesus talks about the Sheep and the Goats in Matt 25. The people are confused and asked, “When did we give you something to eat or drink? When did we welcome you as a stranger or give you clothes to wear or visit you while you were sick of in jail?” Jesus replied, “Whenever you did it for any of my people, you did it for me.” Matt 25:37-40 We serve Christ, by serving others. Servanthood is culturally defined – that is, serving must be sensitive to the cultural landscape while remaining true to the Scripture. This is both the challenge and burden of servanthood. Servanthood is not an easy task. Sometimes it can be a burden, it can involve suffering, and it will be challenging at times. Once again, as disciples of Christ we are called to serve Him. We serve other people by entering into a relationship of love and mutual commitment. Jesus came into our human context (incarnate), ‘The Word became flesh and made his dwelling among us’ John 1:14. To make Christlike disciples of nations we must develop relationships with others centered around Christ. The author continues to set the tone of servanthood with the illustration of the robe and the towel. Jesus clarifies the two roles: robe – representing the Lord and Christ roles – he shares with no one, for he alone is worthy and the towel – representing the humble, obedient, suffering servant – a role he modeled for us throughout his life. The disciples never seemed to get it until it was too late. They envisioned themselves wearing the robe, enjoying prominence, perks, privileges, and royal status. For the last three years the disciples had been following the most powerful man in the world, literally touching and holding the robe of Jesus. However from the beginning, the nativity, the scene announces humility, lowliness, weakness, and exposure. The last image of Christ as he hangs on the cross displays humiliation, suffering, failure, and to some, defeat. Through the ministry of Jesus, his life suggests anything but a life of humble service – the life of the towel. In biblical times, when a robe was given to another it was considered a special honor. After three years of being with Jesus, the disciples were still pursing the robe – prominence and status. Jesus alone claims the title of “Lord” and shares it with no one. The lordly model is not for his followers, we are to follow him by his servant model. Greatness is not the goal. Service is the goal, and greatness is defined by Christ in his lifelong exercise of servanthood: “Whoever wants to become great among you must be your servant” Matt 20:26. The greatest expression of humility was displayed in John 13. Jesus washed his disciple’s feet. Foot washing was generally performed by the lowliest servant. Jesus does the unthinkable, the King of kings and Lord of lords, bows to his knees and without a spoken word humbly washes the feet of his disciples. Jesus told the disciples, “You also should wash one another’s feet. I have set you an example that you should do as I have done for you.” The example has been clearly defined for the disciples to understand and live. The robe of royalty is not pictured here however the display of greatness through humility is shown for all to follow. Disciples of Christ are to follow him only in his humble, obedient servant role. Did you know? Biblical writers had to invent a new word, tapeinophrosune, to describe the humility God possessed. Tapeinophrosune – lowliness of mind, gentleness of spirit and meekness of attitude. In summary, we are never more like Jesus than when we serve others. Sounds like a great book Ty! Looks like I know what we will be reading next! 🙂 Maybe a good small group study? Thanks for posting. By the way, we love your video posts too!Love and miss you brother.